KOKOMO TO YS & COLLECTIBLES. 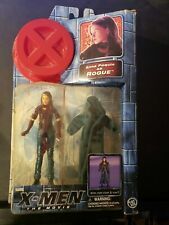 X-Men Classics Rogue Action Figure - Marvel - Toy Biz 2000. Condition is New. Shipped with USPS First Class Package. Made By Toy Biz 2000. Box Is In Ok Condition Not Mint. In unopened box. Some wear on box and a price tag. Actual item in photos. 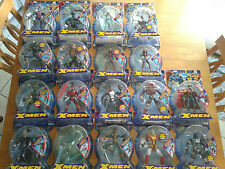 Marvel Legends toybiz Classics X-men x-treme extreme Rogue HTF Fair Condition. Condition is New. Shipped with USPS Priority Mail. But even an ex man needs a little R&R now and again and in her civilian guys, broken do just that. Special collector's edition. Contains civilian and superhero wear and accessories. Fully poseable, highly detailed. There is a small tear on the top corner as you can see in the picture. I TRY TO TAKE DETAILED PICTURES AND SHOW ALL DEFECTS. Trending at C $14.03eBay determines this price through a machine-learned model of the product's sale prices within the last 90 days. Condition : New, MOC (mint on card), minor shelf wear, as pictured. Accessories : Complete. The Original Mutant Super Heroes. Air Strike Wolverine (House of M), Stealth Wolverine, Nightcrawler. Last pic shows the worst ones. Avalanche, Ultimate Sabertooth, Archangel, Magneto. I am a huge collector myself and love the whole process of collecting and trading. It is in great condition with minimal shelf wear. Colors are vibrant on the card and the bubble is clean without any dents. Rare Vintage Original X-Men Rogue! 1994! Sealed! MOC! Manufacturer: Toy Biz. Manufactured Date: 2000. New in the Box. Made by Toy Biz 1997. New X-Men The Movie: LOGAN & ROGUE Action Figures with Claw Strike Action! Excellent Condition! This one had a little yellowing in the bubble. I also have a higher grade one for a little more. Then I can send an invoice for you. This link is usually only found in checkout on the desktop version [not on a phone or in the app]. : SEE PHOTOS . If you see a big pink arrow; it points out a flaw - If you do not understand what an arrow is pointing at = ASK. Light shelf wear see pictures. NEW, 1999, MARVEL, FAMOUS COVER SERIES, ROGUE, 8” FIGURE, TOY BIZ. 8” Ultra Poseable Action Figure With Fabric Costume Special Collector’s Edition Famous Cover Rogue Toy Biz Marvel Comics Great addition to any collection! MADE BY TOY BIZ IN 1996. BOX IS VERY GOOD WITH NO TEARS OR SPLITS. CELLOPHANE INTACT. SHE IS 10" TALL WITH FULLY POSEABLE BODY AND ACCESSORY INCLUDED. Marvel X-Men Classics -ROGUE- Action Figure w/Missiles Firing Action Platform! NEW, 1999, MARVEL, FAMOUS COVER SERIES, ROGUE, 8” FIGURE, TOY BIZ, MINT, EXCL. NEW IN NEAR MINT (GRADEABLE) CONDITION (PLASTIC KEPT). SPECIAL COLLECTORS EDITION . Excellent Condition an 8 out of 10! 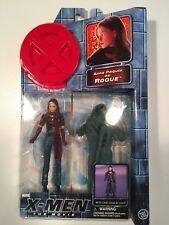 X-Men Action Figure Anna Paquin as Rogue from X-Men the Movie 2000 from Toy Biz. 6” tall figure with accessories lots cloak and scarf Sealed with scuffs/ wear to box present. Bends to plastic X on the top. Item is firmly attached to card as pictured. Condition is New. Rare Vintage Original X-Men Rogue! 1994! Sealed! Marvel T-Shirt Offer Inside! Special Edition Marvel Universe trading card enclosed! X-MEN, THE ORIGINAL MUTANT SUPER HEROES, ROGUE, DELUXE EDITION, 10 INCH FULLY POSEABLE ACTION FIGURE, TOYBIZ, 1995, MINT IN BOX. Box is in good condition, with some wear & tear, a crease across the right rear of the box, and has never been opened. Free shipping is for USA only! INTERNATIONAL BUYERS: Please use ebay's Global Shipping Program. PayPal only. Manufacture/Date: Toy Biz, 1994. This toy is still sealed and complete! We are always buying! Condition: Sealed and complete! What you see in the pictures is what you will be getting. 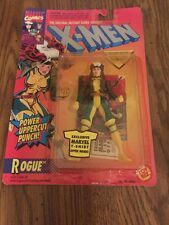 MARVEL COMICS - X-MEN - DELUXE EDITION ROGUE 10" ACTION FIGURE - 1995 . Condition is New.